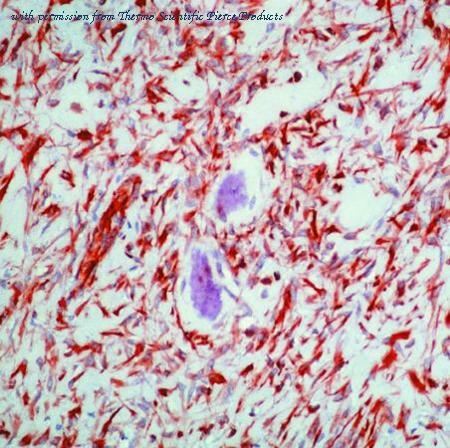 Formalin-fixed, paraffin-embedded human osteosarcoma stained with Vimentin antibody using peroxidase-conjugate and AEC chromogen. Note cytoplasmic staining of tumor cells. 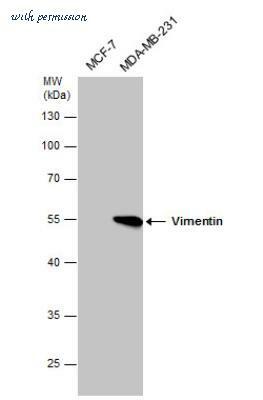 The Vimentin antibody from Proteintech is a rabbit polyclonal antibody to a recombinant protein of human Vimentin. This antibody recognizes human,mouse,rat antigen. The Vimentin antibody has been validated for the following applications: ELISA, FC, IF, WB, IHC analysis. The Vimentin antibody from Proteintech is a mouse monoclonal antibody to a recombinant protein of human Vimentin. This antibody recognizes human, mouse, rat antigen. The Vimentin antibody has been validated for the following applications: ELISA, IF, IHC, WB analysis. 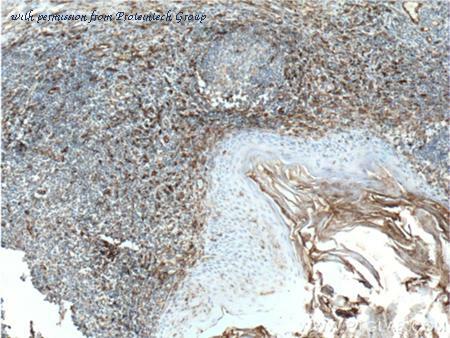 The Vimentin antibody from Proteintech is a rabbit polyclonal antibody to a fusion protein of human Vimentin. This antibody recognizes human,mouse,rat antigen. 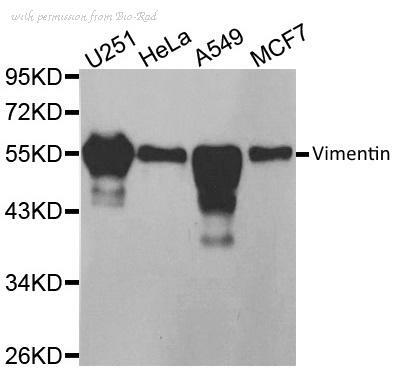 The Vimentin antibody has been validated for the following applications: ELISA, WB, IHC analysis. Immunocytochemistry/Immunofluorescence: Vimentin Antibody [NB300-223] - View of mixed neuron/glial cultures stained with NB300-223 (green) and rabbit antibody to GFAP antibody NB300-141(red). Vimentin is expressed alone in fibroblastic and endothelial cells, which are the flattened cells in the middle of the image which appear green. Astrocytes may express primarily GFAP, or GFAP and vimentin, and so appear red (GFAP only) or golden yellow (GFAP and Vimentin). In cells which express both GFAP and vimentin, the two protein assemble to produce heteropolymer filaments. 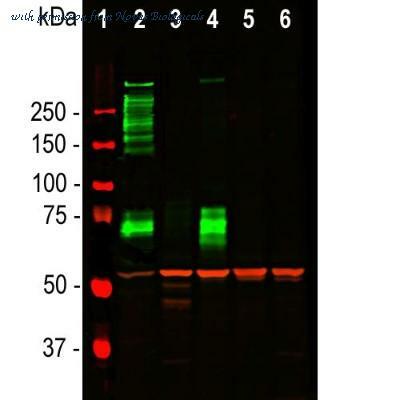 Western Blot: Vimentin Antibody [NB300-223] - Western blot of crude extract of human embryonic kidney Hek293 cells stained with NB300-223, showing a single strong clean band at approx. 50kDa. Western Blot: Vimentin Antibody [NBP1-31327] - A. 30 ug 293T whole cell lysate/extract. B. 30 ug HeLa whole cell lysate/extract. Western Blot: Vimentin Antibody [NBP1-31327] - Sample (whole cell lysate) A: 293T 20ug B: 293T 10ug C: 293T 5ug 10% SDS PAGE, antibody diluted at 1:3000. 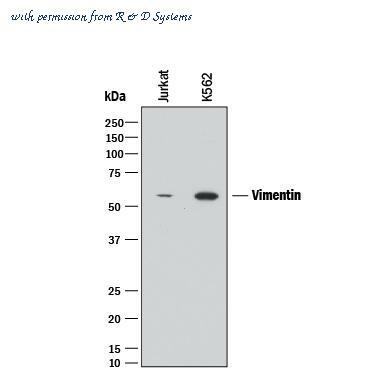 Detection of Human Vimentin by Western Blot. Western blot shows lysates of Jurkat human acute T cell leukemia cell line and K562 human chronic myelogenous leukemia cell line. PVDF membrane was probed with 2 ╡g/mL of Rat Anti-Human/Mouse/Rat Vimentin Monoclonal Antibody (Catalog # MAB2105) followed by HRP-conjugated Anti-Rat IgG Secondary Antibody (Catalog # HAF005 ). 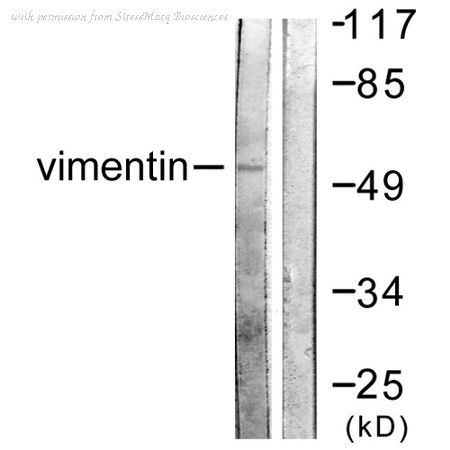 A specific band was detected for Vimentin at approximately 55 kDa (as indicated). This experiment was conducted under reducing conditions and using Immunoblot Buffer Group 1 . 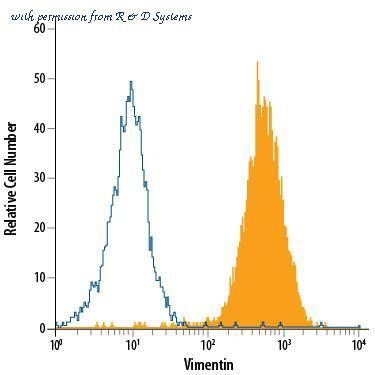 Detection of Vimentin in A172 Human Cell Line by Flow Cytometry. 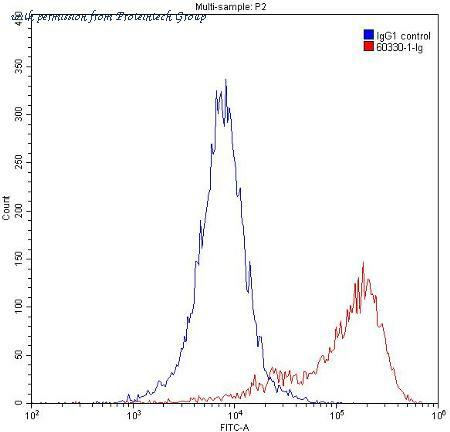 A172 human glioblastoma cell line was stained with Rat Anti-Human/Mouse/Rat Vimentin APC-conjugated Monoclonal Antibody (Catalog # IC2105A, filled histogram) or isotype control antibody (Catalog # IC006A, open histogram). To facilitate intracellular staining, cells were fixed with Flow Cytometry Fixation Buffer (Catalog # FC004 ) and permeabilized with Flow Cytometry Permeabilization/Wash Buffer I (Catalog # FC005 ). View our protocol for Staining Intracellular Molecules . 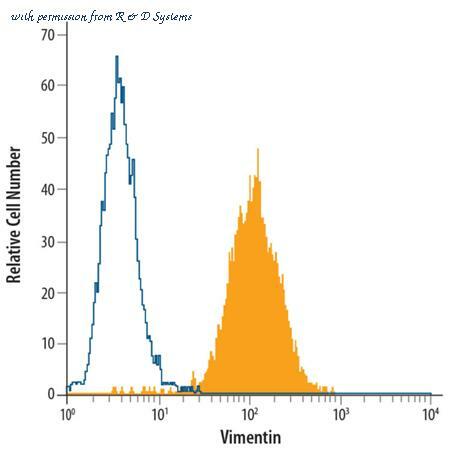 Detection of Vimentin in A172 Human Cell Line by Flow Cytometry. 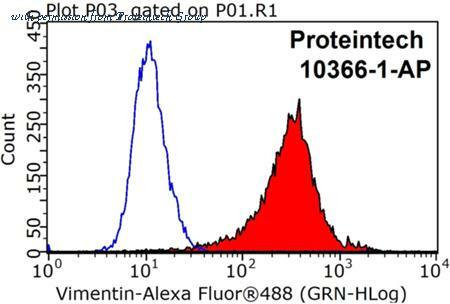 A172 human glioblastoma cell line was stained with Rat Anti-Human/Mouse/Rat Vimentin Alexa Fluor« 488-conjugated Monoclonal Antibody (Catalog # IC2105G, filled histogram) or isotype control antibody (Catalog # IC006G, open histogram). To facilitate intracellular staining, cells were fixed with Flow Cytometry Fixation Buffer (Catalog # FC004 ) and permeabilized with Flow Cytometry Permeabilization/Wash Buffer I (Catalog # FC005 ). View our protocol for Staining Intracellular Molecules . Immunocytochemistry analysis of U251 cells using Vimentin (pSer55) mAb (4A4). 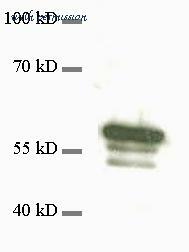 Western blot analysis of U251 interphase (1) and U251 M phase (2) cells, probed with Vimentin (pSer55) mAb (4A4). Immunocytochemistry analysis of phosphorylated vimentin (Ser71) on 4% PFA fixed U251 cells with [pSer71]Vimentin, mAb (TM71). 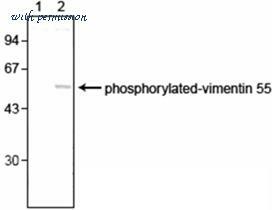 Western blot analysis of phosphorylated vimentin (Ser71) expression in U251 using [pSer71]Vimentin, mAb (TM71). 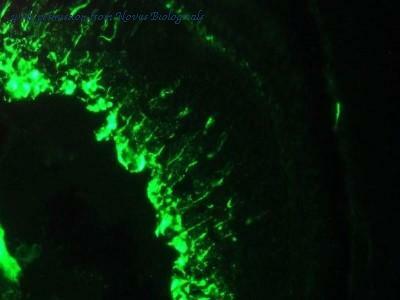 Immunofluorescence Microscopy of Chicken anti-Vimentin antibody. Tissue: Mixed neuron/glial cultures. Fixation: 0.5% PFA Antigen retrieval: not required. Primary antibody: Vimentin antibody at 1:500 for 1 h at RT. Secondary antibody: Fluorescein chicken secondary antibody at 1:10,000 for 45 min at RT. Localization: Vimentin is found in many kinds of mesenchymal and epithelial cells as well as developing neuronal and astrocytic precursor cells in the CNS. 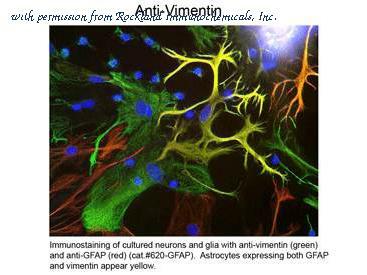 Staining: Vimentin Antibody as green fluorescent signal, GFAP Antibody as red, Vimentin and GFAP as yellow. 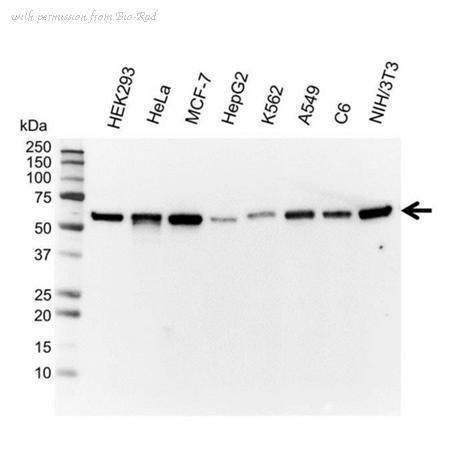 Western blot analysis of Human HepG2 cell lysates showing detection of ~54kDa Vimentin protein using Rabbit Anti-Vimentin Polyclonal Antibody (SPC-1338). Lane 1: Human HepG2 cells, treated with Adriamycin (0.5uM, 5hours). Lane 2: Untreated. 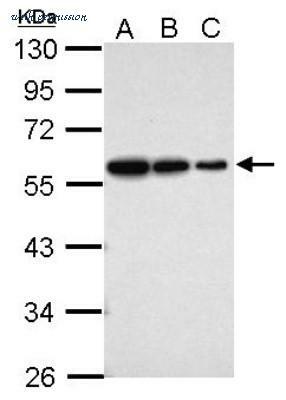 Primary Antibody: Rabbit Anti-Vimentin Polyclonal Antibody (SPC-1338) at 1:1000. Predicted/Observed Size: ~54kDa.